You know the saying, “Abs are made in the Kitchen.” It’s so true! Here’s how you can eat Pizza and still get abs! Give this recipe a try. 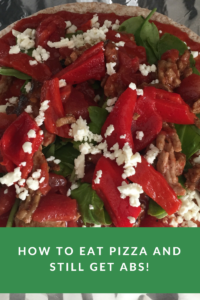 It’s my version of Coach JVB’s pizza recipe that she posted on National Pizza Day. It’s a low calorie balanced meal. Best of all the kids can get involved with making dinner and they can choose their own healthy toppings for their pizza. I love it because, it’s quick, fun and easy especially after a long day.